In celebration of the NFL’s release of the all-22 and end-zone film for the 2012 season, each week we’ll be bringing you the best in offensive- and defensive-line play. For the winners of last week’s inaugural Trenchie’s, click here. The numbers would be enough (3.5 sacks, a handful of hurries, unspecified amount of mayhem caused), but the most impressive part of Clay Matthews’s night last Thursday is that it still mattered five and six days later. Matthews’s dominant night against the Bears got a left tackle chewed out, a left guard relieved of his duties, and a quarterback strung up for chewing out a left tackle. The widespread damage is fitting considering the type of game Matthews put together. Left tackle J’Marcus Webb got most of the heat, but the Packers and defensive coordinator Dom Capers moved Matthews around the formation all night. Bears right tackle Gabe Carimi joined Webb and left guard Chris Spencer in the trail of victims. Matthews’s first sack actually came against Spencer late in the first quarter. 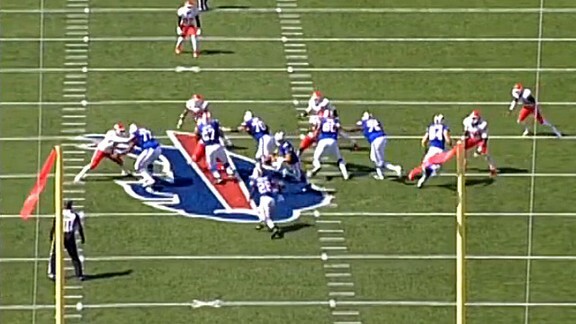 As you’ll see above, after initially lining up on Webb’s outside shoulder, Matthews (52) bumped down inside. From the snap, it was clear Spencer was outmatched, and a simple inside rip move from Matthews was enough to collapse the pocket, bring Cutler to the ground, and put the Bears in second-and-20. The sack total would triple by game’s end, but after beating Webb to the outside for no. 1.5, the final two were mostly a product of coverage and/or Cutler being flushed to whatever side Matthews was manning on the play. Of the two plays that stood out to me, none ended with a sack, but each was a negative play for the Bears that probably could have been much worse. The first came at the 12:26 mark in the third quarter. 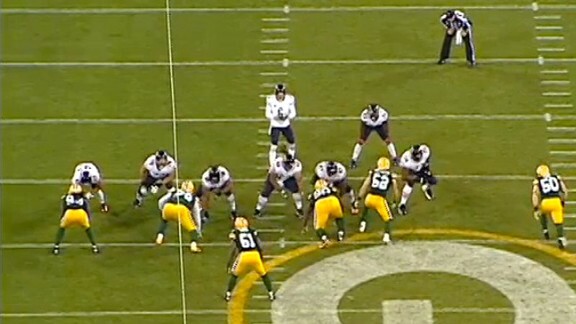 The Bears had second-and-9 from their own 41 (image above), and Matthews is lined up outside to the right. 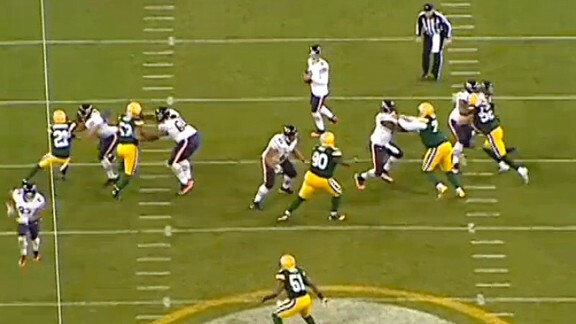 The play is an example of how pass-protection missteps can tend to pile up. More than once in the first half, Matthews beat Webb to the outside with a speed rush. An effort to combat that (by pass-setting for a speed rush and not allowing Matthews to get to his outside shoulder) leaves the left tackle vulnerable to a straight bull rush. That’s exactly what Matthews employs here. After taking one step outside, Matthews turns back in, puts his helmet in Webb’s chest, and drives him straight into the quarterback. 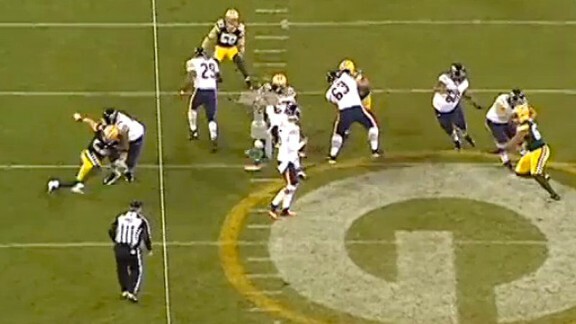 The result is a throw that should have been intercepted by safety Morgan Burnett. Matthews’s pass rush options make the battle between him and Webb something of a full-contact game of rock, paper, scissors. There’s a bit of guesswork involved in figuring out how to answer whatever the opponent is going to throw out. If Matthews comes with a speed rush on every play (paper, paper, paper), the logical reaction would be to set for speed (scissors). The problem is the uncertainty of when the defender is finally going to throw out the rock. The second play has nothing to do with Matthews’s ability to win small mental games or change up styles. It’s more about being an all-world athlete who shouldn’t be able to do something like this. The above shot is from a second-and-10 for the Bears in the fourth quarter. Pass rushers are taught to give as little of their frame as possible to offensive linemen, and part of that technique involves dipping an inside shoulder low to the ground and bending their path back to the quarterback. In this shot, it looks like Matthews (far left) is employing that technique to the point of his own detriment. He’s so low that his left knee is dragging on the ground, and it looks as if the play will almost certainly end with Matthews on the ground and Webb flopping on top of him. Well … not so much. Matthews maintains his balance, lifts his body back up, bends back toward the quarterback, and gets a holding flag as Cutler throws another incompletion. It’s a special combination of balance and power, and for a 6-foot-7 offensive tackle, a move that’s almost impossible to counter. When the Texans’ defense made its remarkable turnaround from the 2010 to the 2011 seasons, much of the credit was given to the organization’s decision to bring in former Cowboys head coach and standout coordinator Wade Phillips. There’s no doubt that employing Phillips and his 3-4 scheme had something to do with the leap, but it doesn’t hurt to add a few more players who consistently win the matchups they’re placed into. Defensive scheming is great and all, but football, at its simplest, is about the individual battles within a game, and that’s what makes J.J. Watt so much fun to watch. The second-year defensive end led the Texans in tackles last week (side note: He had five. When your leading tackler has five tackles, it’s a good sign you’re going to win. Handily), and spent much of the game showing off the combination of technique and ability to defeat blocks that made him what he was as a rookie. He also spent much of the game abusing right tackle Guy Whimper. 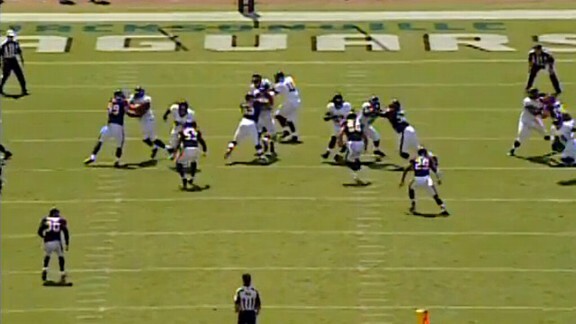 This is a shot from the Jaguars’ second play from scrimmage. 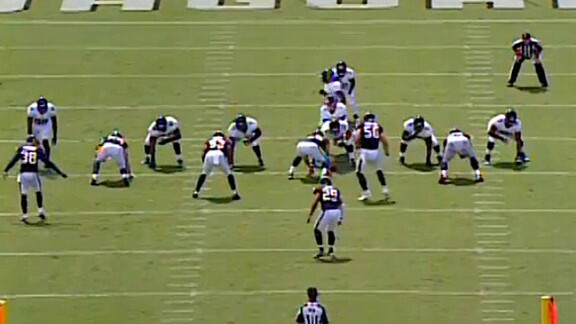 Watt is lined up on the outside shoulder of the right tackle. The play is an inside run, and it would seem as if Whimper has an angle. Here, it doesn’t matter all that much. Whimper takes an awful first step, and with one inside move, Watt is in the backfield, ready to haul down Maurice Jones-Drew as he gets back to the line of scrimmage. 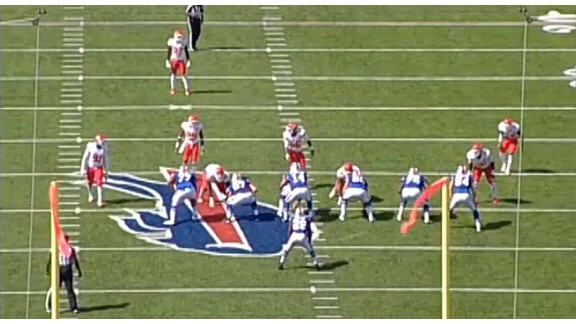 That play is just as much about Whimper’s error as it is Watt’s ability, but the one above is not. Lined up on the outside shoulder of the right tackle, here Watt does an excellent job of getting his hands on Whimper to create separation while also maintaining outside leverage as the edge defender. By keeping space between him and the offensive lineman, Watt is free to diagnose the play, shed the block, and drag down Jones-Drew for a loss. It seems simple, but his technique is nearly perfect, and the ability to play with leverage and defeat blocks, no matter how advanced the scheme, is the foundation to winning defense. This award will usually be reserved for sustained success over the course of a game, but this week, one play stood out too much to be overlooked. The Bills’ offensive line isn’t the Niners’, and C.J. Spiller gets much of the credit for his performance against the Chiefs, but the Buffalo line had its moments on Sunday. My favorite play was one Bill Barnwell discussed yesterday when assessing whether the Bills’ running game is for real — a 38-yard gain in the second quarter that eventually led to a Buffalo touchdown. 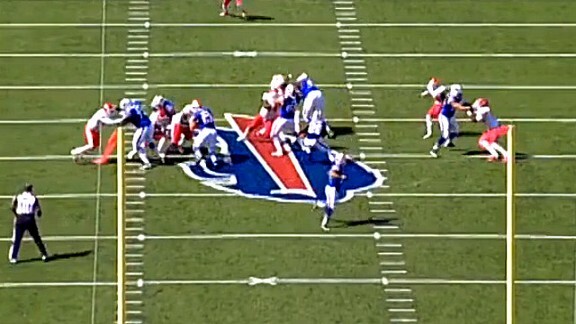 On second-and-5 from midfield, the Bills are lined up with Spiller as the single back and a tight end off the line to the right (above). The five linemen and the tight end are responsible for the six box defenders, which include the two down linemen, the two inside linebackers, and the two standup outside linebackers. The play looks like a simple zone-blocked run to the left, with each of the six de facto linemen and Spiller taking a step to the left in unison. When run correctly (see Texans, Houston), these plays are something to see from the end zone view. 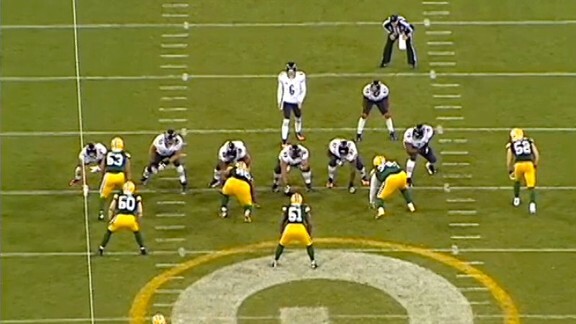 In the photo above, the right tackle–right guard and center–left guard pairings are tasked with blocking the two down linemen and the linebackers behind them. Each of the rightmost linemen in the pairings has his left hand on the hip of the other as they move in step to the second level. As the action moves to the offense’s left, both Hairston (the right tackle) and Eric Wood (the center) have angles on the two linebackers. The result is a devastating block from Hairston, who lifts linebacker Derrick Johnson off his feet in creating a huge cutback lane for Spiller, who makes the in-the-box safety miss en route to a 38-yard gain down the sideline.